Walking through our neighbourhood, it's always interesting to see how many people store their bicycles out on the porch. Passing one particular block, it seemed like every other house had one. 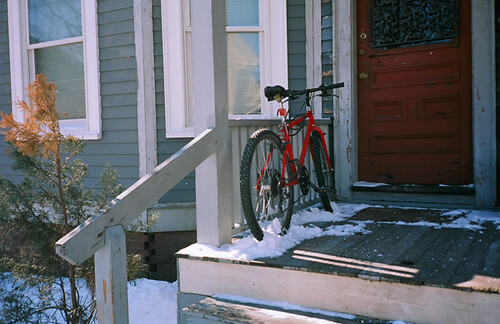 Occasionally readers ask whether storing a bike on the porch is a good idea, especially in the winter months. And as usual, it depends. Indoor bike storage can be tough around here, so it's understandable that for many the porch offers a happy compromise. The bike is protected from precipitation by a roof, so it won't be soaking wet or covered in snow come morning. It is on private property and not out in the street, which offers some peace of mind. And it doesn't take up valuable storage space indoors. But a porch does not make a bike theft-proof or immune to the elements. 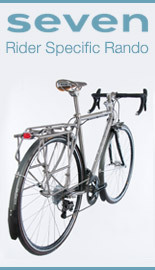 It goes without saying that the bike should be locked up securely, ideally with a thick chain. And if you live near salt water, or in an area that gets heavily salted in winter, rust will form despite the roof cover. Components may still freeze, due to moisture getting into them. I have also heard accounts (though have never seen this with my own eyes) of steel bicycle tubes distorting when left outdoors through the winter - most likely due to water condensing, then freezing inside the tubing. The best candidates for porch living are either beater bikes that you do not care about damaging, or heavy-duty utility bikes with thick tubing, durable paint, and rust-resistant components. Both categories also have some built-in theft protection by virtue of being perceived as too unappealing or heavy to steal. Personally, I would not hesitate to store a bike on my porch, if I had one - though not a delicate or expensive one. And not one heavy enough to make the porch cave in... something I saw the other day during one of my walks. I am less worried about theft in the winter than in the summer. All those snow banks and icy steps! I was thinking that too. Our current snow bank height is 1 bike's worth. Lock your bike no matter what! We have a fenced off front yard, so I used to keep my bike on the porch unlocked. Lo and behold, one day it got taken. They must have climbed over the fence and lifted the bike over it, because the lock on the fence was not disturbed. Lock your bike! I've stored bikes on the porch most of my life, and never had problems. I figure that any bike I'm willing to commute on (and thus leave outdoors all day) might as well sit in the yard at home. Can't do much more harm. Now if I could afford a "nice" bike, it would live inside and be treated like a pampered pet. It was one of those vintage US cruisers, but it looked like the real culprit was that the floor boards had rotted through. No pictures, sorry! I have a porch, but am far too paranoid to leave my bike out on it. Instead, it sleeps in my dining room at night. Always makes for an interesting conversation when I have guests over for a dinner party! My dream house has one of those for sure. 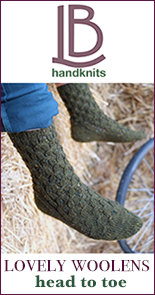 Great for boots and winter wear, tho! A mud room too small for bikes, how cruel fate is! We keep our mud in a closet. Our mud outted itself long ago, Spindizzy. If someone wants your bike, they'll steel it. I've known people to have bikes stolen from locked garages, enclosed porches, backyards, cars. In Somerville, my roommate and I had our bikes stolen from out of the basement. In that case one of the bikes was found because the Somerville police officer road centuries and realized that it was very odd to see a teenage boy on touring Bianchi with a woman's saddle and stem! Anyway, when I finally bought a place, safe bike parking was a requirement and I keep the most used bikes in the front hall - much to dismay of my home organizer. 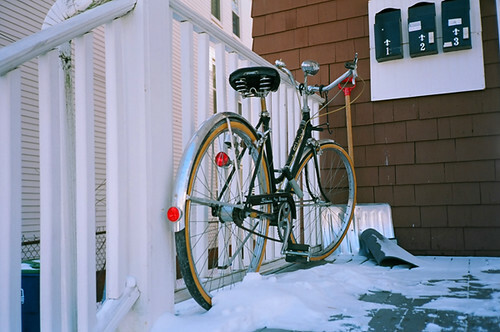 When I lived in Brookline, my bike was stolen from our front porch-- the thief used a crowbar to break the thick wooden railings, in order to remove my locked bike. I've been loath to lock bikes outdoors since then, even clunkers. 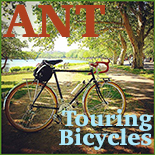 "I have also heard accounts (though have never seen this with my own eyes) of steel bicycle tubes distorting when left outdoors through the winter - most likely due to water condensing, then freezing inside the tubing." Aluminum frames are prone to this issue as well. I've backed off a BB cup and watched ounces of water hit the floor. If the spindle has a seal of good heavy grease and the frame lacks a dedicated drain hole there's nothing to prevent this. The vent holes built into the frame don 't vent much when it's cold outside. And the vents may be plugged by salt and filth. Open top seatposts make for a great vent but can admit lots of water if you don't use fenders. Haven't yet seen a frame tube expanded by ice but it would not surprise me if this has happened. The first chainstay I ever replaced was on a nice vintage MTB where water got in the vent hole at the drop out and collected at the lower end by the BB. It looked like it had gotten pretty rusty before getting left outside in the cold. The water froze, expanded and split the stay. Right now there's a nice old step-through Schwinn 3sp. under my deck that just appeared a couple of weeks ago. I tried to ignore it hoping someone would steal it or it would wander off on it's own but I've just about decided to let her in the basement. I feel bad for her out there in the cold. I think bikes that get ridden and loved a bit can handle porch life but the neglected and homeless just give in to corrosion and self pity. I've had people steal old tires from the back of my truck the night before going to the dump, firewood ripped off in the middle of summer etc., but no takers for this old girl. I suspect it's like when people dump kittens off at farms, they figure farmers will either give em' a home or drown em' and either way they're off the hook. Well I can't bring myself to drown her so anyone who wants her can have her. Luckily, bike are slightly easier to find homes for than kittens. I don't understand why it's not considered universal practice to drill a hole in the bottom of the BB shell during frame production. It's the most effective way of preventing accumulation of water inside a frame, and has no ill effect. I've taken to drilling my own on bikes that don't come pre-drilled. I've asked a couple of framebuilders this question, and the answer was something like "because it gets clogged with grease and debris anyway, no point weakening the BB by drilling it." The BB on the one I pulled the stay out of was open to the shell from the chainstay socket, but the old style plastic spindle sleeve was enough to corral enough crud from the stream crossings that flooded the stay in the first place to keep the stay from ever draining into the shell. But in this day of sealed cartridge BBs I would still drill the shell like you say(and try to rust proof the interior of the frame as well as possible). The BB shell is so strong, most old lightweight racing bikes had huge sections of the shell drilled out, often in intricate patterns. One drain hole can't weaken it. And clogged? I don't buy the argument, even if it comes from experienced frame builders. Modern BBs are sealed units, there's no muck from grease. 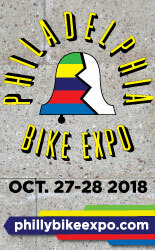 AFAIK your old friend Peter Weigle drills his bottom bracket shells, plugs the hole with a Presta valve cap for a wet ride then pulls it out when he gets back to let it drain and dry things out. You could even pull the seat post out every now and then when it's warm and dry to let the dampness evaporate. I've never thought about water getting into the shell via the chainstay vent holes, but that would explain why the last cartridge I pulled out was soaked! FWIW I don't buy the argument either, but what do I know one way or the other; I can only collect opinions at this stage. kylecycler, I didn't want to mention names, but since you mentioned it, for his last frame, JPW drilled a large pattern of holes in the BB shell, larger than needed for a drain hole. I think it's mostly for style points, but has the added benefit of draining and venting. I would not bother plugging up the hole for a ride in the rain. If the hole is on the bottom, there's no reason water should splash up into it. Lateral and othe rstress is real - bb30 anyone? Criminy. The way most of us ride, drill (relieve) the thing and let's get on wit it jah? Frozen, buckled and distorted tubes? Media fear tactics! It must be true - someone on the internet heard it somewhere. I live where the temperature stays below freezing from December to March. The worst thing you can do is store a daily use bike in a warm (above freezing) area. Once it is frozen, leave it outside and keep it frozen, far less rust. As for bent broken tubes due to freezing... I say urban myth. Provided the bike is dry and clean, taking it inside in the winter is not going to increase the risk of oxidation. Depending on its content, steel freezes somewhere between 1,000 and 2,000 degrees F. Even the most extreme liveable outdoor indoor swings are too minor to have much of an impact. Of course failure to clean a bike that has been exposed to salt and chemical laden snow and ice before taking it inside ones home will subject the bike and a whole lot more to risk of corrosion. Low temperature by themselves wont damage metal, but letting a pipe, tube or other form fill with water and freeze will deform and ultimately rupture it. Every time the water thaws, it takes up all the extra volume from the expansion caused from the last freeze cycle and swells the tube a bit more the next time. It's easy to demonstrate for your self, just fill a section of pipe or other tube with water and leave it outside or in your freezer. It may take a while depending on how many freeze-thaw cycles it can withstand but in the fullness of time it will swell up and split. That's why steel fence/gate posts have caps. If you look you might see posts that have lost their caps and are swollen/damaged down at ground level. Happens all the time. I'm interested to know if freezing temperatures slow down the oxidation process, I'll have to look into that. Spin, I'm no chemist despite the fact that I play one at work, but I think the reason really cold temps are associated with lack of oxidation is because of low moisture content. When the air is so cold that it does not support moisture (it precipitates out as solid), there's no moisture to fuel the reaction between oxygen and iron. Matthew J's comment about any temp below 1,000 degrees = freezing for steel helps keep things in perspective here. I keep my commuter (the Pash) outside 24/7. On the porch at night and right out in the elements all day. The only problem I've encountered so far is freezing of the brakes (levers and brake arms of the drums) if it has rained during the day and then sat out in a hard freeze overnight. Usually solvable with a hairdryer if I remember to leave myself enough time in the morning to thaw them out! As for safety, I've often times forgotten to lock up at night. No one has messed with it. But we live somewhere where people don't want bikes like that. Maybe if it were a pricey MTB or road bike it might be more tempting. But honestly, we can even leave our house to go shopping and leave the front door open (the glass door is shut, so the cats can look at the birds, but the actual locking door stays open) and no one will bother a thing. Park it on the porch and keep your local mechanics happy. I HAVE seen a bike whose seat tube was exploded by filling with water and then freezing but I unfortunately don't have a photo so you won't believe me anyway. Anyhow if I remember correctly it was a mountain bike that somebody left outside (here in rainy Amsterdam) without a seat post. Why not a cover, like some people have for their motorcycles? A marine canvas shop could whip one up, if it's not already available.